The issue of undocumented immigration has dominated news coverage and policy discussions, with the Trump administration passing an executive order on interior enforcement in early 2017 and, more recently, threatening to suspend federal funding to sanctuary jurisdictions and announcing an end to Deferred Action for Childhood Arrivals (DACA). How might Asian immigrant communities be affected? According to the latest available estimates, there are about 1.7 million Asian undocumented immigrants in the United States. To put those numbers in perspective, they account for about 16%, or 1 out of every 6, undocumented immigrants in the United States. This also means that about 1 out of every 7 Asian immigrants is undocumented. 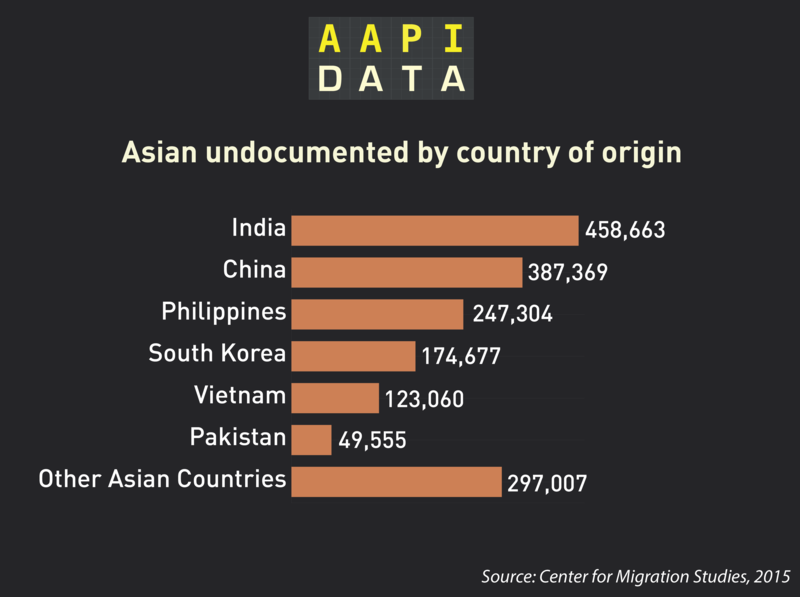 The Center for Migration Studies (CMS) and and the Migration Policy Institute (MPI) have published the most recent estimates of the Asian undocumented population in the United States. The total number of Asian undocumented ranges from 1.46 million (MPI, 2014) to 1.74 million (CMS, 2015). The tables below are from the Center for Migration Studies 2015 estimates. 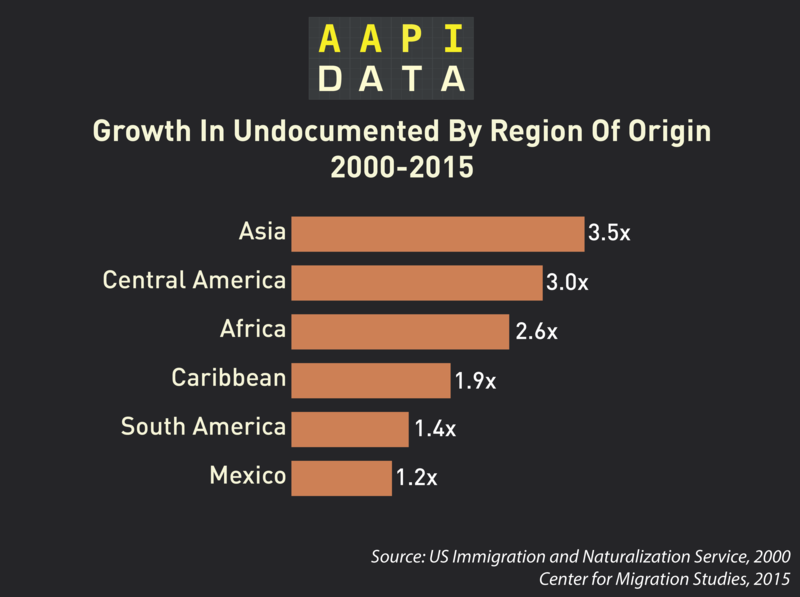 Importantly, the Asian undocumented population has more than tripled within 15 years, from the INS estimate of 500,000 Asian unauthorized in 2000 to the CMS estimates of over 1.7 million in 2015. By contrast, the Mexican unauthorized population grew by only 21% during the same period, from about 4.8 million in 2000 to 5.8 million in 2015. India and China account for the largest share of the Asian undocumented (26% and 22%, respectively), followed by the Philippines (14%), South Korea (10%), Vietnam (7%), and Pakistan (3%). The remaining countries from Asia account for 17% of the Asian undocumented population. According to both CMS and MPI estimates, California, New York, New Jersey, Texas and Illinois are the states with the largest number of Asian undocumented, with MPI and CMS only differing on the order of New Jersey and Texas for the third and fourth largest states. The 2015 estimates from Center for Migration Studies (CMS) are provided below. The share of the Asian immigrant population that is undocumented varies widely across states, with states like Georgia, Colorado, New Jersey, and Hawaii having relatively high shares of Asian immigrants who are undocumented. 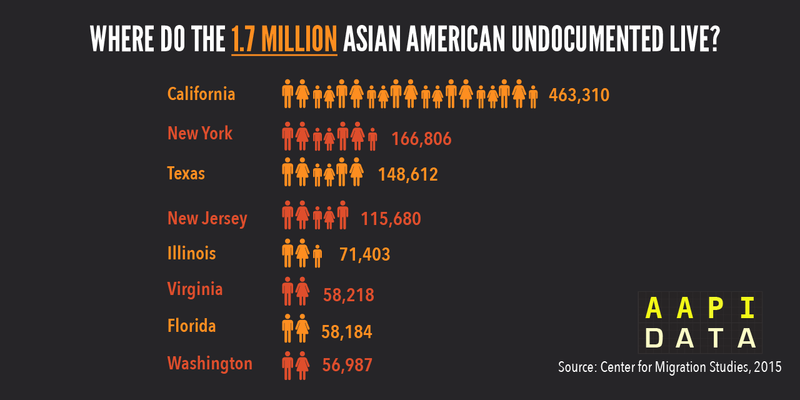 Finally, in most states, Asians make up relatively small portions of their total undocumented population. Still, there are six states where Asian immigrants account for a third or more of the undocumented resident population. These data reveal the extent to which Asian immigrant communities are affected, nationally and in various states. Hopefully, this information can also inform better policy decisions and philanthropic decisions affecting the undocumented immigrant population in the United States.